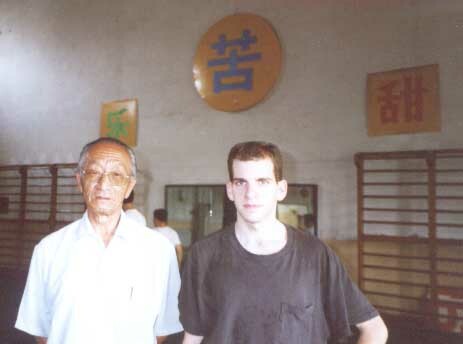 My longtime amigo Patrick Lee got me into Wushu back in our freshman year at UC Berkeley. I've loved it ever since, I may not be that good at it, but I train hard and I find I am constantly improving. Here's some info about my training in Wushu (try clicking on the links). NEWSFLASH! Yes! Summer of '99 I finally went to China! I spent the month of June training with the Beijing Wushu team, mainly focussing on Xing Yi Quan and the Three Section Staff. I have learned from a lot of people, the people listed here have coached me for an extended period of time or in some depth, I have also learned sets, gone to seminars, or gotten help from many other athletes and coaches, but they aren't listed here. Click on the links below to see an animated gif of the form.